Larry began his career in fundraising in 1998 at Asbury University. In his current role, he provides leadership and oversight to the campaign, annual giving, fundraising communications, development services, prospect research and management, stewardship, events and volunteer programs. In addition to earning a B.A. 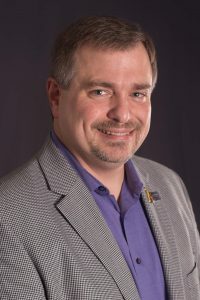 in journalism and media communications from Asbury University in 1993, he also holds a Certificate in Fundraising Management from the Lilly School of Philanthropy at IUPUI. Larry and his wife, Teri ’93 (who serves as the senior graphic designer at Asbury), have two daughters, Rachel ’16 and Emily. They had the privilege of serving as advisors for the Abiding Class of 2002. Outside the office, Larry enjoys cooking, road trips and serving on the live video production team at his church.